A beautiful selection of artisan chocolate bars (each bar is 100g). - Madagascar Dark Chocolate Bar:Single origin organic Madagascar dark chocolate 70%, infused with warm spices. 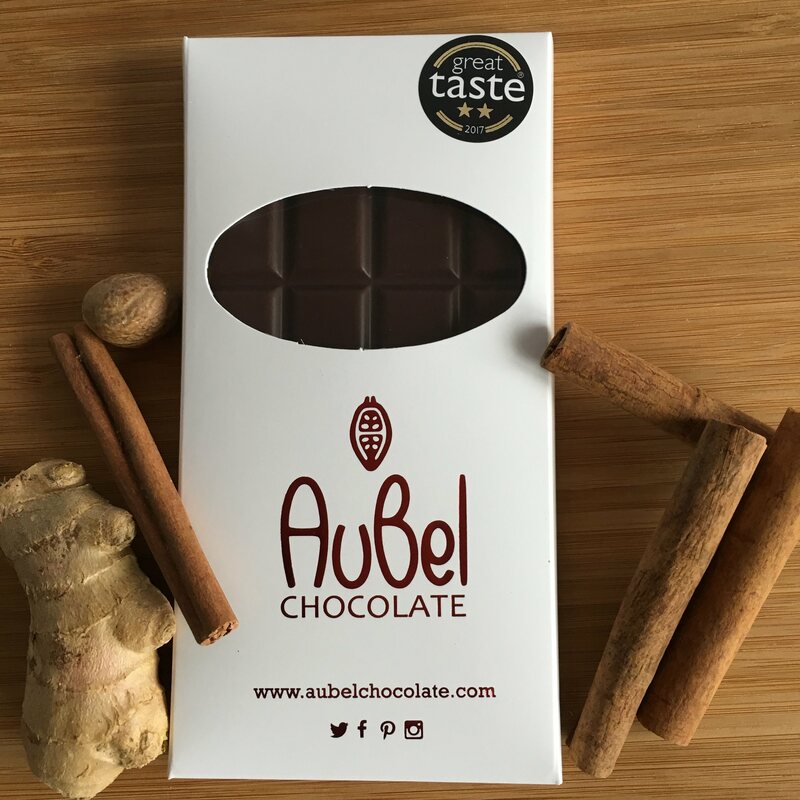 Winner of two gold stars, Great Taste awards 2017. - Madagascar Dark Chocolate with Almonds and Cranberries: made with organic single origin chocolate from Madagascar with lightly roasted almonds and dried cranberries. 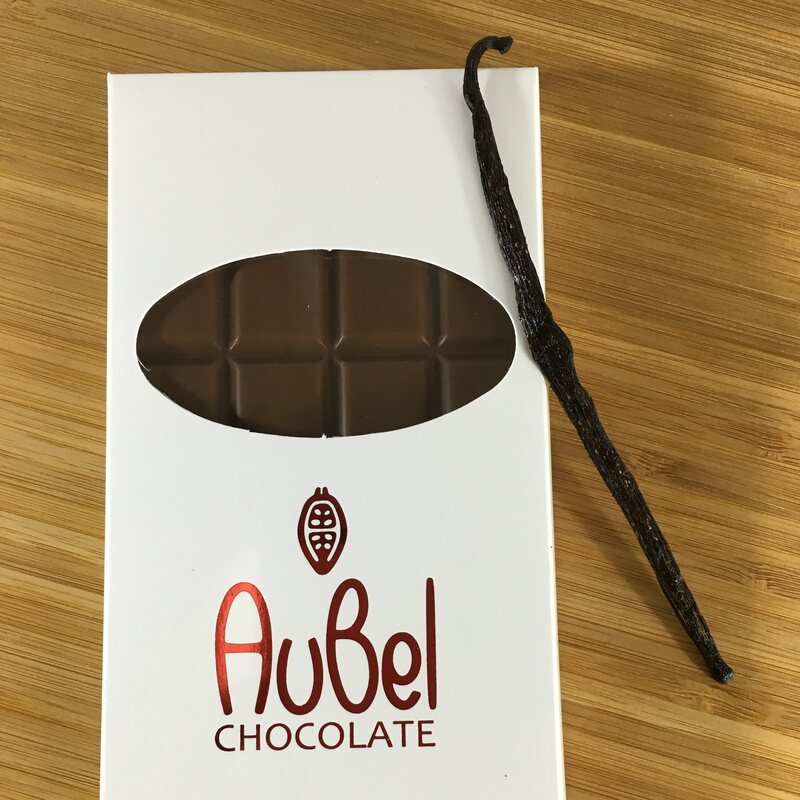 - White Chocolate Bar with Cardamom: Fine white single origin madagascar Chocolate infused with green cardamom. Milk Chocolate Bar with Sea Salt Butterscotch and Pecan: Milk Chocolate (sugar, cocoa butter, whole milk powder, cocoa beans, emulsifier: soya lecithin, natural vanilla flavouring), Pecans, Sugar, Butter, Sea SaltMilk chocolate min. cocoa solids 41%; min. milk solids 21%. Madagascar Milk Chocolate Bar: Fine Madagascan Milk Chocolate (Cane Sugar, Madagascar Cocoa Butter, Whole Milk Powder, Madagascar Cocoa Mass, Emulsifier: GMO-Free Sunflower Lecithin), Cocoa Butter, Madagascan vanilla podsMinimium Cocoa solids 51%; Minimum Milk solids 25%. White Chocolate Bars with Cardamom: Madagascan Fine White Chocolate (Cane Sugar, Cocoa Butter, Pure Cow Whole Milk Powder, Emulsifier: GMO-Free Sunflower Lecithin), Cocoa Butter, Cardamom.White chocolate min. cocoa solids 34%; Min. milk solids 25%. 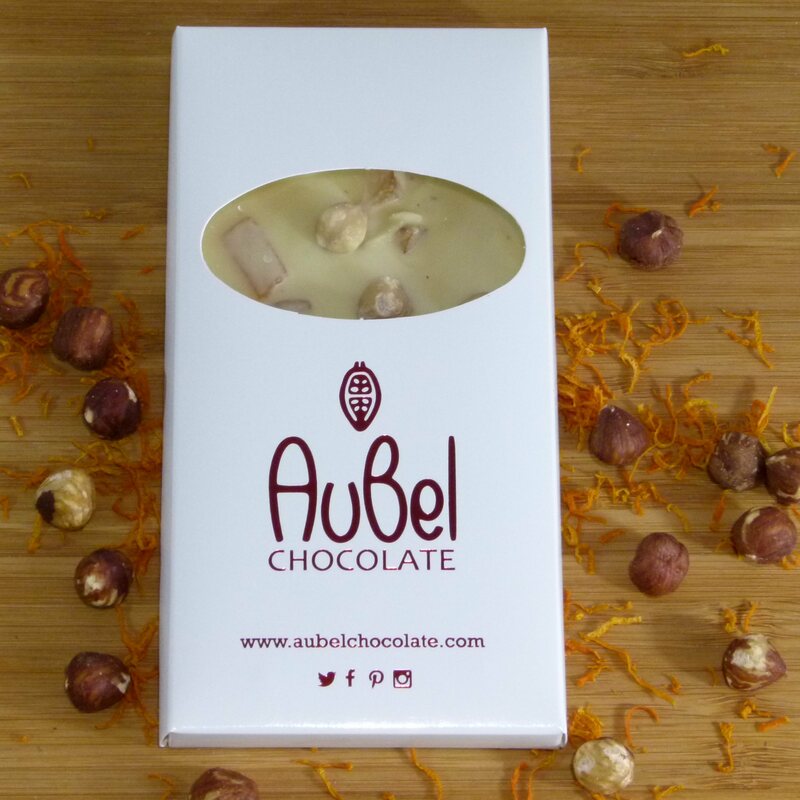 White Chocolate Bar with Hazelnut and Orange Peel: Madagascan Fine White Chocolate (Cane Sugar, Cocoa Butter, Pure Cow Whole Milk Powder, Emulsifier: GMO-Free Sunflower Lecithin), Hazelnuts, Candid Orange PeelWhite chocolate min. cocoa solids 34%; min. milk solids 23%. I used to be a Hotel Chocolat subscriber, but Aubel Chocolates are just on a different level. The chocolates have depth without bitterness, and the palate displayed in the flavour combinations is - I think - exceptional. I bought the Christmas selection last year and - sadly - felt unable to share them with the rest of my family. 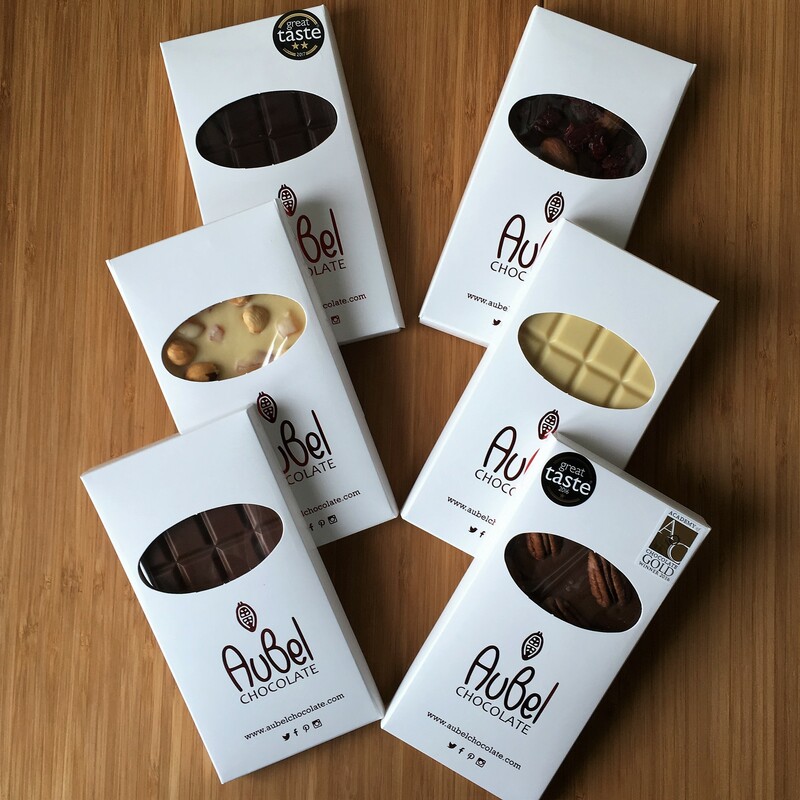 This product is dispatched by AuBel Chocolate . This item has a shipping weight of between 100g and 10,100g depending on the options selected.